Posted by Jonathan Fries on May 1st, 2017 . 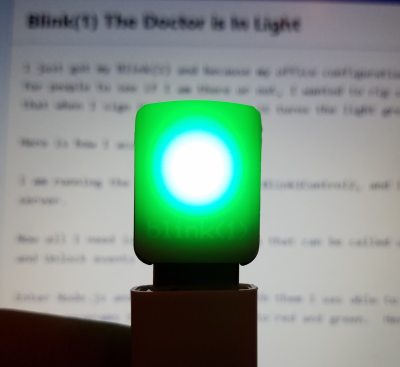 I just got my Blink(1) and because my office configuration makes it hard for people to see if I am there or not, I wanted to rig something up so that when I sign in to my computer it turns the light green. I am running the current version of Blink1Control2, and I activated the server. Now all I need is two small programs that can be called when the Lock and Unlock events fire. Think that's the real port? Guess again! Lastly you just need a way to call these when you lock or unlock your computer (Windows 10 in my case). This StackExchange/SuperUser article was very helpful in figuring that out. After some quick debugging and testing, I locked and unlocked and the light turns red/green. Boom! All told, it took about an hour, but most of that was figuring out how to plug the pieces together. I was not envisioning using Node to solve this at first, so that took me a minute. That was some good fun. When I get it set up in my office I will post a picture of that also. I don't love running the control program, but I think if I want to go deeper it will take more time and I think what I have will work.